Carve a beautifully feminine silhouette for special occasions with this cold shoulder dress. Adorned in a feminine floral print, trimmed with a sweeping bardot neckline and fashioned from a smooth, scuba fabric, this gorgeous dress finishes a demure knee length and can be styled with high heels and bag to complete your look. Have purchased this dress to wear on a cruise later this year so haven't worn it yet. I had already bought one of similar style for dress wear over the festive period so I knew it would be a comfortable fit and I really feel so good in it. 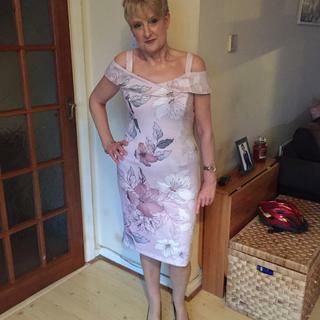 I tried this dress on & it looks lovely - great quality & design but I am having to return it & re-order - the size 16 fits except under the arms where it is a few inches too big!! I hope size 14 fits! Good value, very comfortable and lovely dress. Lovely dress which I purchased for a wedding. Looks and feels comfortable on. Great length for me, just below my knee. Nice material and very flattering. 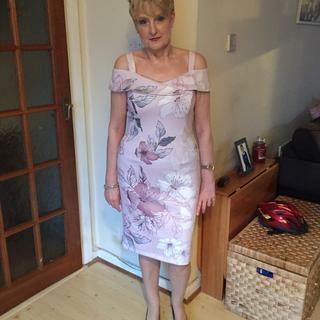 lovely dress purchased as my mother of the bride outfit! Ordered 2 sizes & kept the smaller size as the fit is spot on. Great delivery service & returning the one dress was easy & refunded quickly. 1st time I've brought from Roman and very impressed. Purchased this dress to get married in. (I’m 52 ??). Just going to me and future husband at the ceremony, wanted something not to over the top but still a bit classy. This dress is ideal. However as a previous reviewer has said it gapes at the underarms, I’m going to get this taken in with my local seamstress. Other than that the dress is so comfortable great length and looks fantastic. A really classy dress. Material is lovely, crease free. Fit is normal size for me. Colours unusual which I like. Looks classy when on. Lover it,love it, love it. Great fit and perfect for the wedding in July I have been invited to. A dress to make you feel special whilst wearing it. It is a beautifully made dress. It is fully lined, very smart, but very feminine and pretty. I bought it for an early summer wedding, for which it will be perfect. Very nice fit. Good size 12 fitted perfectly. Would definitely recommend this dress. This dress is beautiful - the fit is true and the fabric feels amazing . I can truly recommend this, would be fabulous if it was available in a range of colours. Great fit.Lovely color perfect for a summer wedding. Very good service & clothing well made. I have purchased quite a few clothes from your shop. Find them all so flattering & stylish. Very good clothing. Staff also very helpful. I tend to shop at Freeport Hornsea because we live there. Love this style and already have this is other colours. Lovely summer colour. I saw this dress in Chester and liked it very much but didn’t buy it there and then as I wasn’t sure what shoes etc to wear with it. Ordered it on line and decided on silver and it all looks great. Can’t wait to wear it to the wedding. Very pleased with this purchase. Will definitely go there again. I love this dress. The design, colour and material are great. Fits really well and feels comfortable. Just right for any occasion. Have recommended it and other Roman products to my friends! True to size very flattering fit and good quality would suit formal occasion, cruise wedding or just summer outing. Would definitely recommend . Bought this to wear at a summer wedding. i love it! It fits perfectly and looks and feels far more expensive than its price tag. Cant wait to wear it! Lovely dress. Great quality for the money. Wore it to dinner last Saturday and all my friends thought it was amazing. Lovely dress. Perfect for my son’s wedding in September. Style just right for me. A generous fit for a size 12 - could possibly fit into a 10! Will be shopping again at Roman Originals. Fast becoming my favourite brand. Thank you! Lovely dress I think the colour is more lilac than pink though. It fit perfectly. I bought this dress for an event mid Spring and the colours suited this. The dress itself is so comfortable and it falls just on the knees so perfect. The material is lovely and confortable - can't wait to wear it. i am 5" 6 will this dress come past my knee? BEST ANSWER:Our models are 5'9 so this dress should come past your knee.